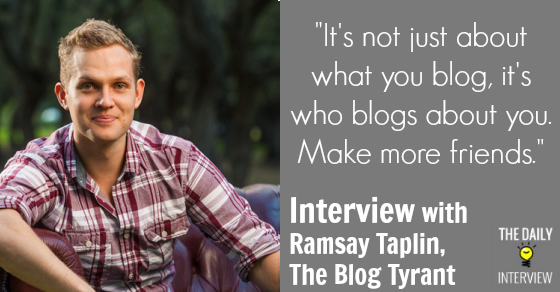 My guest today, Ramsay Taplin, is widely known as one of the best bloggers about blogging. It may be a somewhat cliche topic to start blog about, but this guy really takes it to a whole new level. More than just writing good content, he knows how to build an active community. If you look at his blog, Blog Tyrant, you will see exactly what I’m talking about. 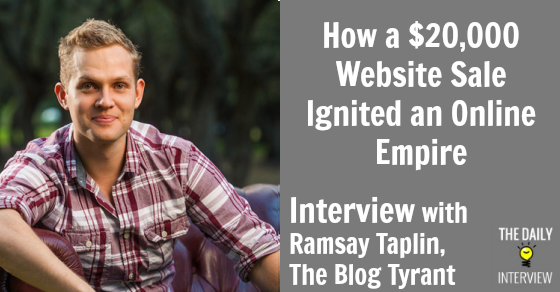 In this interview, Ramsay shares his story about how he got started in this business, including several blogs that he was able to build and eventually sell for 5-figure sums. Check out the interview and read more about his online empire. Ramsay, Blog Tyrant is absolutely one of my favorite blogs today. Your posts about blogging and internet marketing are very compelling, thanks to not only brilliant content (obviously), but fantastic post titles that really draw people in. Tell us a little bit about yourself and your journey – how did you get into blogging? I’m sure your business has evolved throughout the years – what are you most focused on today? I was a high school kid obsessed with bodybuilding and martial arts when I first got started. I created a terrible Angelfire website with flaming text and scrolling banners all about my training and fitness ideas. It was pretty ordinary. But it hooked me in. A few years later I was in university skipping lectures and tutorials to go and read about blogging and making money with Adsense. I sold one website for about $20,000 and was hooked. It took me a long, long time to decide what I really wanted to do. I’m not a guy who can focus on earnings if I don’t enjoy what I’m doing. Finally, though, I feel like Blog Tyrant is where I want to put my energies for a while. What has been your greatest success (or successes) so far with your blog or within your online business overall? There have been so many small milestones along the way that keep me going. Selling blogs for 5-figures a few times, reaching 1,000 and then 10,000 subscribers, being able to pay for trips to Asia with affiliate income. I love sitting down one day and coming up with an affiliate strategy and then seeing it pay off in a few months’ time. But, to be perfectly honest, the best thing about my job (by FAR) is when I get emails from people telling me how much my writing has helped them or inspired them to get started. Without that feedback I would have stopped a long time ago. Two things: losing time to anxiety and selling a blog. Around three years ago I started getting really bad anxiety out of the blue. For about a year I lost myself to it. I struggled to work, put on a lot of weight and really let it hit me. It wasn’t until I started facing up to it with study, meditation, and help from people who knew what it was like that I started to push through. I wish I’d recognized the warning signs earlier and avoided triggers like working too hard, staying up really late and eating badly. As for the blog sale – there was one that I sold that I really wish I hadn’t. I wasn’t ready for the cash (I was just a uni kid) but also the brand could have become really, really huge by now if I’d hung onto it. The new owner just let it go to ruin within a year or two. Feels like a missed opportunity. It seems like you have some good experience selling blogs, even if it didn’t always end well. What are a couple tips you can share with someone who has a popular (and money-making) site and is thinking about selling it? First of all I’d make sure that you really, really want to sell that baby that you’ve grown and developed. Will you be happy with someone else writing on it and taking the brand in new directions? Make sure you’ve got the logistical things covered, like do you have good stats for them to see? Are they accurate representations of your blog or did you only install them recently? What about your Twitter account; who keeps that? Lastly, consider talking to an experienced lawyer. They’ll help you get a good deal and, although it’s expensive, they can help you do things like add clauses so that the new owner won’t start selling adult material or anything like that. You’ve built a massive following and readership base with Blog Tyrant, so I have to ask, how did you do it (in general)? What are some tips you can offer to someone who is just starting out with no audience? I guess for starters I would make sure everyone knows how to start a blog on WordPress and avoids free hosting. That is a really big one because you want to build an asset you can control. It’s so important to have a distinctive brand – I just don’t think you can do that on a free service. And that is really important – be distinctive. You don’t need to be original but you do need to stand out and be memorable. That means knowing what your brand is and what you want people to do when they interact with it. The name, logo, design, style, voice… all the way down to the content you write and how you promote it needs to be delicately and deliberately consistent. Focus on how to get more email subscribers but also know what you are going to do once you get them. Random content isn’t enough. Lastly, I’d recommend people have a read of my post on starting a blog in 2014. That’s got a lot of my ideas about what I think will work in the coming months. What are the ways you typically like to monetize a blog (either Blog Tyrant or others that you have owned), and of those, what’s been your favorite (either because it’s been the most financially rewarding, or it’s something you really enjoy)? In the old days I used to be crazy for Adsense. I got such a thrill out of earning money from someone just clicking an ad that I stuck in my content. I loved trying new colors and placements and seeing what earned the best. These days I’m more passionate about the Tyrant Troops (my email subscribers) and being more useful to people. By taking a slower approach to making money I feel like I’m building something that genuinely helps people and if there ever is an affiliate I want to promote or a product I want to launch I have that base of lovely people to show it to. I’m in love with AWeber because it lets me split test my mail outs as well as my opt-in forms. I always find it fascinating to see which copy or image brings in the most subscribers and then how those subscribers interact with my content over time. I think if you can get used to doing that for subscribers you can then expand it out to landing pages, advertising, etc. I’m online most of the day and try to make myself available as much as possible for new bloggers who need a bit of help. The best places are on Blog Tyrant itself or my Google+ and Twitter accounts. Thanks Ramsay for taking the time to share your story with us today! What did you think of Ramsay’s story and advice? Leave a comment below!